Unbelievable Happiness and Final Sorrow, published by the University of Arkansas Press, is a biography of Ernest Hemingway’s private life and the role one woman played in his becoming one of the greatest literary figures of our time. The author, Ruth Hawkins, writes about the most prolific period of Hemingway’s life. She dissects Hemingway’s relationship with his second wife, a relationship that has been overlooked in writing until now, yet one that contributed to significant growth in Hemingway. His second wife, Pauline Pfeiffer, a stylish journalist for Vogue, came from a wealthy family. The two built a strong connection, causing the breakup of Hemingway’s marriage to his first wife, Hadley Richardson. 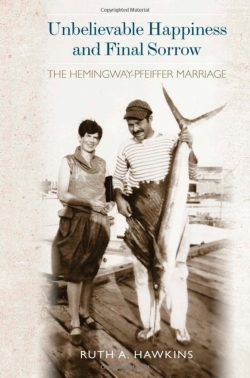 In 1927, Hemingway and Pfeiffer were married and moved to America, where Pfeiffer became the source of “unbelievable happiness” for Hemingway. She was her husband’s best editor and critic, and her family offered Hemingway monetary and moral support. He took full advantage of it, using it for his increasingly profitable writing, extensive travel, heavy drinking and expensive recreational pursuits. Unbelievable Happiness and Final Sorrow reveals the importance of Hemingway’s relationship to the entire Pfeiffer family. Their marriage lasted 13 years, and produced two children. However, their “unbelievable happiness” met with “final sorrow,” as Hemingway wrote. Hemingway moved on, no longer in need of Pfeiffer money. Hawkins is an administrator at Arkansas State University. More about Unbelievable Happiness and Final Sorrow is available from the University of Arkansas Press (http://www.uapress.com/titles/sp12/hawkins.html).